There are many ways of and reasons for meditation. It can be a means of 'prayer', a conscious connection to Divinity, an avenue to bring the broader realities of existence into focus and to retrieve information. It can be a vehicle to connect with your inner self and with others. Meditation is a tool for self realization, change, accomplishment, healing, insight, guidance and creativity. It can be used to bring clarity, wisdom and knowledge into your waking mind, to assist others and to heal relationships. You can send telepathic messages, project energetic forms and discover past lives. - accessing info from the subconscious mind, memory, collective consciousness, universal records (Akashic), etc. Sounds like magic - the transformative power of the universe is within our reach. Meditation is the most useful tool you can learn to expand your consciousness and improve your life. 1) SOLITUDE - Uninterrupted space and time. Find a place where you will not be disturbed for the time you've allotted for your session. You need at least thirty minutes when starting out, preferably more. 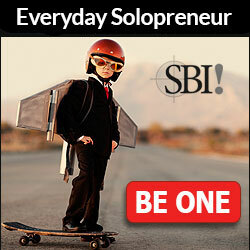 As you gain experience, you can go into a quick meditation easily and most anywhere. 2) LIGHTING - You want it to be soft and soothing. Use a dimmer, nite lite, candlelight or a fabric cover (non-flammable) over a lamp shade. You can also meditate in the dark if you wish. 3) MUSIC - optional. For some, mellow music helps to relax and focus. Others may feel it as a distraction. Try it both ways to see what works for you. The type of meditative session may determine whether you want music or not. It also has the advantage of blocking out any "outside" noise. 4) INCENSE - optional. Helps with clearing and purifying the space you're in. It can help you get "in the mood". It assists with setting up a protective barrier and can enhance altered states. 5) COMFORT - In order to relax and "let go", you should wear non-restrictive clothing (no tight jeans) and make sure your hair isn't pulled too tight. Use comfortable furniture or floor pad. Make sure the room isn't too hot or cool. If you're like me, you'll want to have a shawl or throw blanket handy. 7) TIMER/ALARM - optional. If you don't mind falling asleep - don't worry about it. The use of a timer prevents you from drifting off too long if you do. It also prevents you from being in a certain position too long which can inhibit proper circulation. IMPORTANT if you have circulation problems! You don't want it to be too loud either, you want a gentle call to return to the room. You don't want to be shocked back into conscious awareness. 8) MOST IMPORTANT : Protection AKA Cleansing - Proper preparation will provide a certain level of protection, however, SPIRITUAL protection is ALWAYS required. Not only do you want safety, you also want TRUTH. a) Prayer- Ask for protection against dark energies, falseness, trickery and ill will. 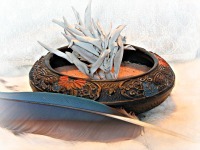 b) Smudging - Use sage or natural incense (made with wood, resins &/or essential oils). c) Visualization - of white light filling the room, surrounding and permeating yourself. d) Affirmation - Make the statement of achievement, i.e., "I am in the Divine white light of purity, protection and love. Only those that come in the light of truth and love may enter my domain, all others must leave." Repeat as many times as you feel necessary to reach your comfort level. Be relaxed and firm, state with certainty. KNOW that you have dominion and the right to choose who or what can reside in your space. That's an inherent part of your free will. e) Burning a white candle - As you light it, make an affirmation, i.e., "This candle represents the white light of Divine love and protection. As it burns, it fills this area with healing, protection and purity." Use can these elements together. You can pray and smudge at the same time. Or, you could pray and light the candle - the candle can also be used like a smudge and taken around the perimeter of the area. 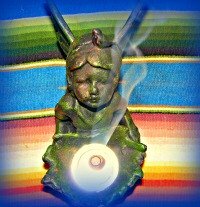 Recite affirmations while visualizing, smudging, etc. Prayer and affirmations are two sides of the same coin. They are the invocation of certain energies. 9) LOG - optional but recommended. Have a notebook and pen handy to record your results. You may also want to list the methods you used for the sake of review. As you practice, you'll see what works best for you. Get in the habit of dating everything you write in your log. So many times I have come across personal writings and wondered when I wrote them. I regret that I didn't date some of them. Keeping a log, to me, is important. The normal conscious mind has only seven thoughts at once. Out of zillions of thoughts in our brain files, we can't keep everything "current" in consciousness. I have found upon reviewing past entries, that I'd received invaluable info from how to correct health and attitude problems to prophecy. I wished I would have paid more attention. Keeping records, reviewing them and dating them are an important practice for personal growth. Understanding the Levels of Meditation will further enhance your process. To proceed directly to the beginning steps of entering meditation, go to Three Step Prep. This is the technique that I use and it works extremely well; it's a great aid. There are probably as many techniques as there are practitioners of meditation and just as many opinions on the subject. I will never say that my way is the only way, it's just the one that I prefer to use and it fits. Try different techniques and find what works for you, or create your own through the exploration of various methods. Find your "fit" and enjoy your journey!